The new improved CPAP Hose Lift v5.5 suspends your CPAP tubing overhead, eliminating hose hassle entanglement and, the tugging on your mask during sleep. It is simply the lightest, most compact home and travel, Dual Use hose management device available; ranked #1 in a 2011 Consumer Survey. Now the HLv5.5 is 12% lighter and 16% more compact – and has a base 14% larger, when folded into its own bag, it weighs 5.5 ounces (156 g) and is only 2.1 inches in diameter by 7 inches in length (5 d. x 18 cm). 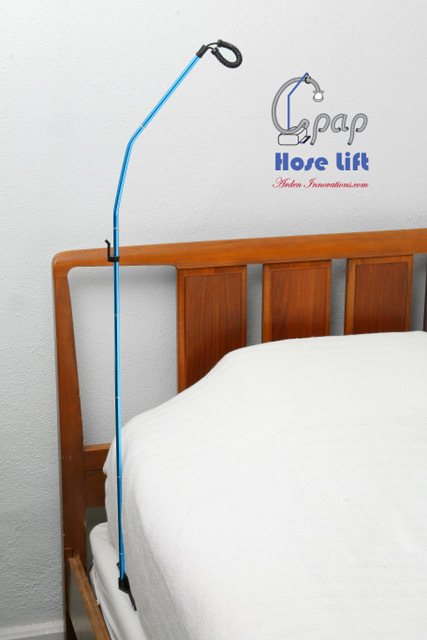 In addition, the CPAP Hose Lift v5.5 includes: the best ease of use Hook for hanging your mask, a Loop sized to accommodate a hose with insulating cover, and now, a base integrally attached to the mast so that the whole system practically self erects. the new version 5.5 Hose Lift has a reversible double bend mast – allowing an optional slight reduction in height and increase in reach. the Base is tubular, of molded fiberglass and aluminum, and it is integrally connected to the mast; 14% larger, with a redesigned deep socket mast connection, and a mast to base cord lock – it provides an even more stable platform, in hose suspension support.